Although personally, I think that's a bit ostentatious and I would usually go for something a bit more low key for my muse/ angel, like maybe Rob. Rob the angel. Rob the muse. Ha. Anyway! So, you've decided that you want to be a big time serious writer and you've picked up Carmel Bird's excellent How-To guide called Dear Writer Revisited and suddenly you get to a point in the text where she tells you something that makes your blood run cold with overused similes and metaphors. You are going to get in your own way. You are your own worst enemy. Your self doubt is going to stop you achieving the things that you want. Then, Virginia instructs writer to make some lists, so you (or in this case, I) make them as well. If you look really closely there, you'll agree that a lot of my list B is based on procrastination and self doubt, and to some extent, that procrastination is a manifestation of the self doubt, so go figure. I am getting in my own way, therefore. I also think that I am taking my writing seriously but also focussing on not becoming a lonely miserable unemployed person who lives in her own filth. I think this is also a worthwhile pursuit and if it takes me longer to get published, so be it. I don't want writing to stop being fun! The next writing exercise was to have a sleep! Yay! Thanks Virginia, I love sleeping. She recommends that writer practice writing first thing after waking up so as to achieve an unfiltered state of being that is unencumbered by the self doubt monsters, who wake up slower than we do. I did do this exercise, but it was largely just an account of the very strange dream I had about one of my favourite bloggers curling my hair for a family member's wedding, and then walking the dog. This kind of meditative writing can also be achieved by writing in public places like cafes and on trains. I prefer cafes myself as there is coffee close by and people who are paid to bring it to you. Yay. Going for a walk can also help to clear the mind. 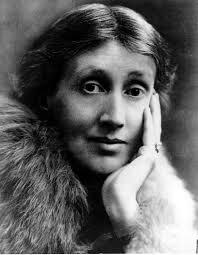 What you are trying to achieve is the state that Virginia Woolf has often described as being immersed and unaware of the self whilst writing. I have experienced this sensation before and I have to say, it is excellent. I think you're entirely capable of achieving everything on List A.
Kristen, aren't you just the sweetest thing! I agree with Kristen! And most of list B can be easily dealt with. You have the dedication, Em, and the self-discipline and courage! I'm convinced you can do it!